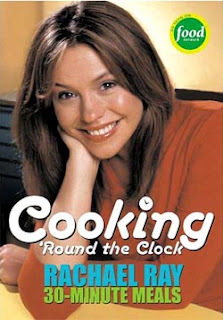 In June, I was the lucky winner of this Rachael Ray cookbook, Cooking 'Round the Clock! If you haven't heard, Kate of Warm Olives...and cool cocktails is liquidating her cookbook collection! What'd you say!? Promise she is. So, lucky us! She is going through her cookbooks one by one and choosing lucky winners to alleviate her overload (and add to ours). I like Rachael Ray. I have a few of her other cookbooks, though I think the funnest ones are the kids cookbooks, but hey... The one stipulation to winning a cookbook from Kate is that you blog a recipe from it within 30 days...no sweat...just what to choose? I didn't have to flip very many pages before I KNEW what I'd be making right away. I love a good sandwich, and I have a few faithful favorites. 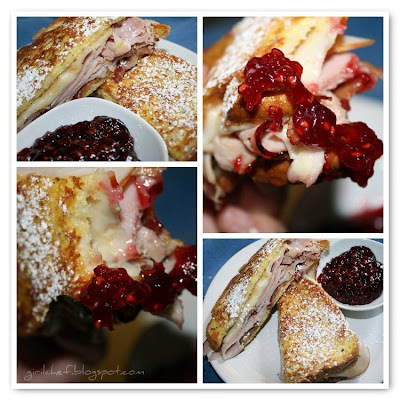 A Monte Cristo has always been in the top few. But I think in all honesty, it may be the novelty of the sandwich that makes me like it so much. Before this, I had only ever made one once at home. I usually get them when I go to Bennigans...which is approximately once every five years or more lately. So, with a few slight changes to make it a Monte Cristo to mirror my personal expectations, this is my first Monte Cristo in (I counted because I actually do remember the last time I ate one) 8 years! Eight years!!! Yikes. Start by cooking your bacon until done to your liking. Reserve. Now, beat your eggs with your half & half, nutmeg & black pepper. In a large skillet over medium-high heat, add a Tbs. of butter and let it melt. Dip your bread in your egg batter (French toast style) and add to skillet, cooking 2-3 minutes per side, or until golden. Once bread is flipped the first time, spread your mustard on one side (cranberry on other if using). Layer your bacon, ham and turkey on one half. Place cheese on other half. Put both halves together and press into place. Cook, turning a couple more times as needed until cheese is melty and meats are warm. Serve with warmed up maple syrup....or do it my way and once you cut it in half, sprinkle it with powdered sugar and dip each bite into raspberry preserves. I honestly can't not eat mine dipped in raspberry preserves. It's just not a Monte Cristo to me if there's no raspberry preserves!!! I also like them dipped in batter and fried...drool...it's that sweet & savory thing that I so adore! Now, go visit Kate and see if you can score a cookbook this month...because a foodie can never have too many cookbooks (well, unless you ask Kate. Or mexichef.) I am also sending this sammie over to Deb at Kahakai Kitchen for this week's Souper (soup, salad & sammie) Sunday!